There comes a time in a woman's life when pizza is the only thing that'll do. Not Mexican. Not Asian. And God forbid any Indian show face. No, it's only pizza that my soul is lamenting over, and it's certainly not that gooey, Chicago-style pizza that everyone loves to rave about (and that which also graces the cover of the October issue of Saveur). My belly cries only for the delicate Italian job of a super-thin crust, splashed with a few light ingredients and then quickly blistered in a wood-burning oven (preferably one I can see from the dining room). Seems the city has become populated with restaurants that serve up pizza just like this, but I find Il Fiasco's version to be unfailing (re: not soggy one day, crisp the next). The past week, I have been on an eating frenzy. I'm doing some research for an article I'm writing about ethnic food in Chicago and have managed to literally stuff myself silly on all sorts of deliciousness. 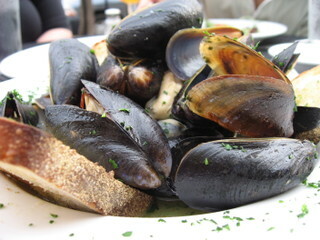 One of my fave dishes I've tasted in a long time are the mussels at Gruppo di Amici (on Jarvis just west of Sheridan). Earlier in the week, I tasted the Mexican version--Mundial Cocina Mestiza--which were so-so...I credit the sub-par rating to the milky broth they were floating in; then there were the French ones at Le Bouchon, which were good, but nothing spectacular (though the salad lyonnaisse with gigantic tears of fatty bacon was); and last but not least, there were the Italian ones at Gruppo. I mean, these guys really know how to do mussels. 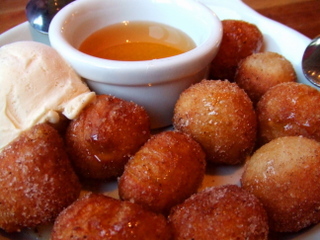 They're the perfect size, all meaty and slippery, just lolling around in a super rich, wine-infused, buttery broth that just begs for a dunk of bread to to go along with it. Which was perfect, because little toasts of bread come on the side (nobody else served bread with the mussels). Try sitting on the patio outside--because you can see the bright blue lake a block away and see the neighborhood change right before your very eyes. Believe it or not, sometimes I leave home without my camera. 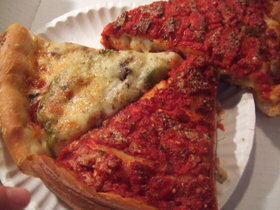 Of course, it's those exact times that I run across the most memorable meals of my life. 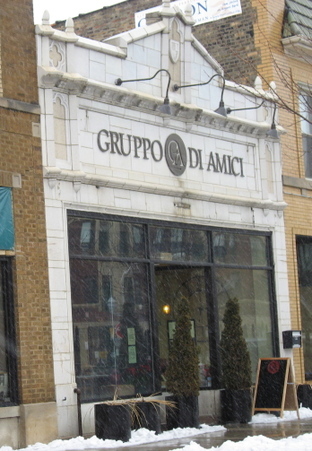 This past weekend was no exception: a slew of pals and I hit up Gruppo Di Amici, 1508 W. Jarvis Ave., one the best neighborhood restaurants in the city. Lucky me, this adorable candle-lit place just so happens to be two blocks from my new home in East Rogers Park. I've been meaning to go there for months, but I've never found the perfect opportunity until a last minute invite from a girlfriend to hook up for drinks and dinner this past Friday night. I suggested Gruppo and the party was on. Showing up before the dinner rush hits is always my MO, especially on a weekend. There's nothing worse than popping into a casual neighborhood joint around 8 p.m. for a nice meal with friends only to find a jam-packed house, a two-hour wait and a frenzied wait staff hating the very sight of your posse. The key is to show up around 6:30 p.m. at a place that's slightly off radar. You're guaranteed the best table, the waiter is delighted to see you, and you can get lit off a nice glass of wine before a soul's the wiser. I never thought I'd say it, but the time has come for me to leave my beloved Roscoe Village neighborhood behind. It's not that I don't love her any longer; it's just that I've exhausted all of the dining opportunities within a three-mile radius. I've chowed at every taco joint, cozy Thai restaurant and quaint sandwich, from the good (Volo) to the very good (Victory's Banner) to the holy-moly-this-is-awesome (Kaze Sushi). I'm craving new horizons and new haunts so it's simply time to move on. I thought when the time came for me to move, I'd hightail it to a remote village in Mexico or the lush mountains of Bali. Instead I've decided that I want to stay in sweet old Chitown and buy a cute little place by the lake. What 'hood have I chosen? I'm usually the last person to try the new place that everyone else is raving about. I like to unearth little gems all on my own, and when there is mad talk about a trendy new restaurant, I quickly lose interest. 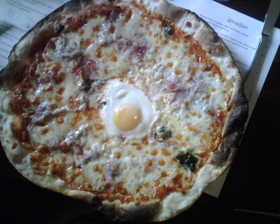 So it's not too surprising that it's taken me a while to try Frasca Pizzeria & Wine Bar, 3358 N. Paulina. Oh, I've walked past it a million times on my way to the gym and Whole Foods, and even peeking in the doors a couple of times when they were putting the finishing touches on the beautiful woodwork (all right, I full on scooted around the large dining room while the construction crew was on lunch break). But once all the glowing reviews poured in, the sense of discovery was shot and I avoided the joint like the plague...until last weekend, when Lisa and I could stand it no longer and had to see what all the talk was about (really, I was just dying for a nice glass of wine and we happened to be walking by). People have told me about The Art of Pizza for years. This tiny storefront has been a mainstay for late night production second meals many a time and for some reason I have never tasted one single bite of their thick and gooey pizza. Of course, I was rip-roaring for a late night shove down a few nights ago and only a big hunk of pizza would satiate my tastebuds. I have to say I was totally impressed with the quality of their pizza...I mean, it's no Spacca Napoli but for $3 bucks, it's a great slice of pizza. The place is tiny and pretty deserted, but that means nothing, I've found. Given that they have delicious ranch dressing (very hard to come by in the fast food world) and delightful thin crst pizza, I can now say that I know where I'm heading when the pizza blues hit--sometimes only a fat wedge (cut into a triangle--not a square) will do. For the past month I've been working like a madwoman on a sports reality TV show out in the 'burbs called "Fan Club: Reality Baseball." We've been shadowing the minor-league Schaumburg Flyers, trying to capture a day in the life of a minor leaguer while the fans, who control the team, dream about who they want in the starting line-up. Come Wednesday the website that hosts this new show is going live. As you can imagine, the past month has been absolutely insane, all I seem to daydream about is a good, solid day off with no sports anywhere in sight. Today I came as close to the day as I could get, and it was totally blissful. My morning started on my bike. I was up at the crack of dawn (so much for sleeping in), tossed on my backpack, met up with my Sunday-buddy Lisa and jammed over to the lake. We were on the make to get some long-absent-from-my-plate fresh fruit and veggies. But, uhh, the Green City Farmers Market is on Wednesdays and Saturdays, not Sundays. That is how delirious I am, confusing every day with the next. The air was thick with indecision. It was loaded with panic. And it definitely had the stench of fear all over it. 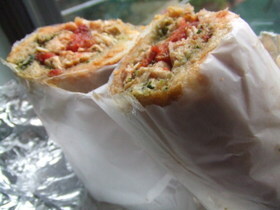 Welcome to the walk-up counter at Trattoria Peppino, where the hungry line is long and the gem of a menu even longer. Credit my building anxiety to all the regulars in line behind me that know exactly what they wanted. 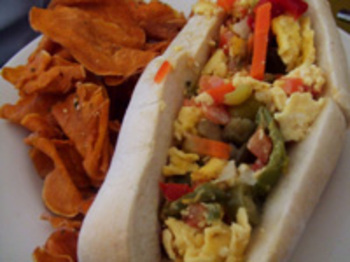 Quick-decision, order-at-the-counter deals are a hellish experience for a chick that labors over every dish and asks millions of questions. Being introduced to a bustling walk-up counter deep in the 'burbs ain't no walk in the park for me. I've always known that Chicago is totally different from Los Angeles. There's the weather, the traffic, the ocean, the attitude, the architecture, the year-round farmer's markets and as my frequent dining buddy, Chezne, recently discovered, there's the BYOB policy. In LA (where she lived most of her adult life), most restaurants have a rule: Even if they have a full bar and liquor license, you can still bring in your beloved bottle of vino for a small corkage fee. Not so in Chicago. She brazenly attempted to convince me that that policy was true here, and I watched her boldly give it a go at neighborhood favorite Anna Maria Pasteria, 4400 N. Clark St.